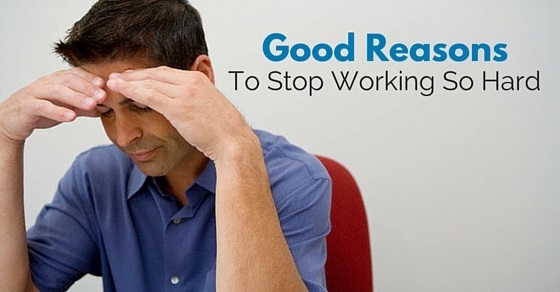 Why you Should Stop Working So Hard and Start Living? When you work the whole day, aspiring to reach the excellence, you end up doing lots of work but with a lack of efficiency. So, when the quantity is taken into the account, the quality gets a back seat. It is better to do less work in a day, but with utter diligence and without compromising the quality of the work. Health is an important factor as it forms the foundation on the basis of which health, you will certainly not be able to work for a longer time period and also you will have to compromise on the quality of the work. But if your health is good, then you will be able to work happily. So, you should keep in mind that more work leads to unhealthy life that affects the work in future. When you work for long haul hours, you ought to say farewell to your nap, which is certainly not good and acceptable. Less sleep means less concentration in the work, less concentration level means the less appreciable work. So, it is better to have full sleep so that you do not become less productive. Whenever you will be attending meetings and the conferences, you tend to feel sleepy and the time will seem never-ending. Also, you will feel bored and very inactive in generating great ideas, or listening attentively, etc. So, it is better to have good sleep and then work instead of having a short nap while working and affecting the results at large. You will feel irritated and impatient all due to being overworked and overloaded. This will cast dark clouds over you and the others working in the office. This will affect the work environment and every kind of business will be affected, like if you are an employee, your work ambience will be affected and if you have a small business, the business will be harmed. The deprivation of deep sleep will surely affect the judgement you give. It will further impair your decision making, which of course is not something you could afford. So, it is better to not over work till late night as bad health not only affects the work but also the image of the company. When the work is affected, you will be summoned as the work at the individual level contributes in achieving a combined goal. When the individual goals are affected then the overall benchmark of the company is not achieved. So, the queries for you will be raised. To prevent the sharp end questions from the boss, you should give good results and those can only be achieved with greater concentration and hard work and not overwork. The work you do will be mirrored in the same manner in the company, which although will be good for the boss but not for everyone in the company. This is because working for too late will affect everyone’s schedule. Also, if you will work untiringly and continuously, the same will be asked by others to do, which ultimately will set a bad example. This way you may have to listen to the blistering remarks of the colleagues for setting a bad example. This is so understandable that people work for long hours in the office only for the sake of money. It is fine to some extent, but why taking a toll on the health for the sake of little more money. You should keep in mind that the money you earn compromising the health will be spent on the health only when you will get ill. So, you should understand that money is not everything and the health should be given the first priority than the money. When you work all time in office, then you tend to make the work and the office your wife or the husband; leaving aside the one waiting for you at the home. Working and not keeping in mind the home and the people who are your own will affect the homes and family relations, which is not appreciable. So, work without affecting domestic relations. It is good to work more but not at the cost of losing the family behind. Life is given by God once and if you spend it with the work and no joy, you will regret at the end of the day. All because you did nothing, but just earned money, which went inside the bank and could not provide you with the real joy of life. So, before it is too late, it’s better to spend equal time in work and also for happiness. One should not be serious all the time. This is because life gives you opportunity only once, for both the work as well as joy. So, one should utilize with equality. Nothing should exceed the other thing like more work will also affect and the less joy will also dishearten you. So, it is better to keep a balance in life when it comes to both work and happiness. Not every time work should be on the priority list. This is because the work will never end till the life goes on. So, if you know, what is less important, you should not give much attention to that thing and focus more on the other priority things in life. There are many other things which should be kept in the priority list like the family, the friends, the social life and so on, so that they are not rejected in life. If you think you will get lots of respect by working for a long time in the office, then you are wrong. This is because the respect is earned not in the eyes of the boss only rather by the whole staff in the office. So, if you do not want the staff members to speak ill of you for working more and raising expectations of the boss from others also to do the same, then better to try balancing the life. There are many other things important in your life. When you work for too long, the food becomes secondary, but this should not be the case. Think! If there is no food in life, how will you get the energy to work. No food means no life, no life means no value of the money earned. So, one should keep in mind that life and food are the initial things to be given the first seat and not the work. When there will be all work and no play, you will undoubtedly become a dull person. Dull in both the senses like in terms of health and also the wealth. So, instead of working incessantly, you should work less but productive. This will not only help in remaining fit, but also less of running to the doctor will be there. So, if you fear going to doctor and spending hard earned money on the medicines, then better to work as per your health demands. When a person does less work, he or she gives the best and most of the time in that particular work only. Not much of the time is wasted in focussing over the unwanted things. This way, the fewer work results to be more fruitful and is appreciated by all. So, it is better to do less but quality work than doing more and zero quality work. When you are all the day surrounded by the company files and the meetings to be attended then it is obvious that the life will become monotonous and uninteresting. One day the work will become a giant on your head and will disturb you day in day out. So, it is better to avoid sadness to hover over you due to the overloaded work and try not to work beyond your limit. Working beyond the concentration level only hampers the growth and also the level of work sinks deep down. When you work more, the energy sinks with the passage of time. Like in the morning you feel fresh and work enthusiastically but when you come within the end of the day, the energy level decreases to a larger extent. So, when the energy level diminishes, the heart and mind call to stop working or the level of the work will reduce; hence making it less appreciable by others. This is believed that the satisfaction level arises only when the work is done with good output. Satisfaction level is never measured in terms of success. So, one should earn satisfaction in life and not in success level. As satisfaction is measured by one’s own mind and the success is measured by others. This is so obvious that you become irritated when down with lots of work in an office, especially when more work is useless and of less importance. You feel like not talking to anyone and prefer to remain aloof from others. This way you speak up loud to the workers who are close to you and make the relation bitter with others. Once you start with the habit of working more and less productive, you end up with doing the same every day. This is because it happens with everyone in the normal day to day life also. When you sleep late at night, you tend to get up late in the morning and when you get up late in the morning the whole day goes with the mind, not at place and peace. So, to avoid commotion in the mind, one should stop working too hard. So, above are some of the tips that you should keep in mind while working. This is simple and understandable that more work and not taking care of the health will only affect your state of fitness; which is not good. No one is saying that work less and stop dreaming about more money. Yes, everyone loves to have a luxurious life, but remember that luxurious life should not be earned by compromising all the health, joy and good times of life. The good times in life that are with parents, family and friends must be enjoyed and should not be ignored at any cost. After all, at the end of the day, the money is just a piece of paper and nothing else. Previous articleWhy is Quitting a Job so Hard in Different Situations?